“I have come to understand that hope is active. It’s something that we have to build, piece by piece, everyday. Not just because it feels good… Sometimes the world feels too bleak, walking through the downpour of setbacks and assaults is too much, and hope seems foolish at best and suicidal at worst. 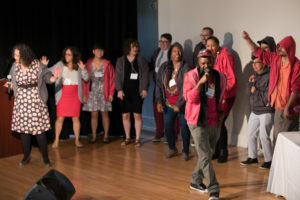 On June 3, over 300 people gathered at Washington Hall in Seattle for Social Justice Fund NW’s 40th Anniversary Celebration. It was a historic occasion, marking four decades of grantmaking to grassroots community organizations in Washington, Oregon, Idaho, Montana, and Wyoming. SJF Executive Director Mijo Lee talked about the long roots of the organization in the Northwest, which was founded in 1978 by a group of progressive donors and originally named A Territory Resource. Two of the original founders – Maxwell Milton and Jill Bullitt – were in attendance and received a special acknowledgement, along with early supporter Andrea Rabinowitz. Three grantee organizations who have received grants since the 1980s – Pineros y Campesinos Unidos del Noroeste (PCUN), Native Action, and the Western States Center – were also recognized. As part of the event, a special installation displayed SJF’s 40 year history, including an artistic representation – using colored pieces of yarn – of every grant made by decade, totalling over 2,100. A decade-by-decade history timeline charted the various foundation milestones, movement moments, and grantee victories SJF has been involved in since 1978, while quotes and portraits of dozens of past and present SJF staff, board members, donors and grantee leaders decorated the exterior of the exhibit. See photo gallery. The anniversary event also featured music from Mariana Harvey and Itsa Shash and poems by 2017 Seattle Civic Poet Anastacia-Renee Tolbert. The keynote speaker was Glenn Harris, a former SJF board member who went on to lead the city of Seattle’s Race and Social Justice Initiative and is now head of the national organization Race Forward. The event was an opportunity to celebrate SJF’s four-decade legacy and reflect on the impact of $18.5 million in grants to community organizations on the frontlines of social change. Perhaps most importantly, SJF has reinvented itself multiple times to adjust to changing political and economic conditions, including the creation of the Giving Project model in 2010, helping to educate a new generation of progressive donors and grow the base of members and supporters exponentially. In 2017, for example, SJF granted over $1 million through Giving Projects alone. Mano da Silva performs to “Shoop” at the Anniversary Party. 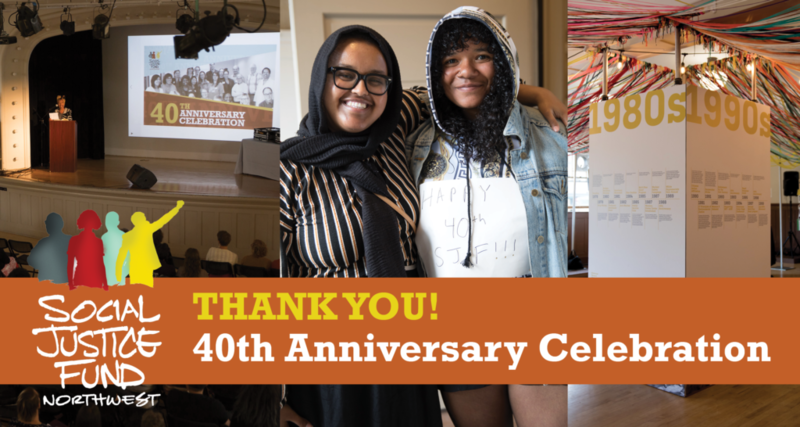 SJF would like to thank everyone who celebrated with us on Sunday, the 40 years of members/grantees/donors who make the work of SJF so impactful, and all those who helped SJF survive and thrive. We would not be here without you. SJF looks forward to many more years of community building, struggle, joy, and funding progressive social change. As Mijo said, we will practice hope as a strategic necessity, striving to make our work even more meaningful and effective.